Ancient art revived in the Valley. Reprinted with permission from "The Rocky Mountain Outlook". For Bow Valley resident Nina Kiyaykina, her art is anything but home grown. In fact, it's grown thousands of miles away, on the remote Aleutian Islands in the Bering Sea. There, the short, fine, rye . beach grass (Elymus mollis) grows, and when Kiyaykina hand selects and harvests enough blades she is able to produce exquisitely tightly woven and finely detailed baskets. Kiiakina works with the Canmore-based Amiq Institute, work that takes her back to her home islands during July and August to harvest the grass, allowing her to continue the tradition for which the Aleuts were once renowned. Back in Canmore, she will carefully cure each blade to prevent mildew or decay She will then, using only her fingernail, split and re-split each blade until she has just thread-like fibers left. These she will weave into a vessel so finely texturized it will feel like linen. The entire process can take up to six months to complete. Kiyaykina is one of a very few number of people left in the world practicing the nearly lost art of Aleutian basket weaving, and a handful of her specimèns are on display at Banff Town Hall this month as part of the fifth annual Homegrown Art Show. For centuries, the Aleut baskets were prized possessions and a valuable trading commodity between native islanders and Russian traders. For trade, the Aleuts wove a vast array of items, including sliding cigarette cases and intricate baskets smaller than a thimble. The baskets are still highly valued and featured in museums and art collections around the world. The 20th century saw the loss of the art after the Russian revolution and rise of communism. However, people on some of the Aleutian Islands, whïch came under the control of Alaska and not Russia, maintained the craft. But under Alaskan, and then American; rule, they faced different pressures and the tradition nearly died off. Kiyaykina knows of only four other traditional weavers still producing grass baskets. Her introduction to the craft came about somewhat accidentally, she said. More than 15 years ago, when she was living on her home island, an ethographer from the University of St. Petersburg; Dr. Rosa Liapunova; was interviewing her mother and asking what she remembered about basket weaving. Her mother's only recollection was from when she was five years old. She and her grandmother had stumbled upon a patch of unseasonably early berries, so her grandmother took a few moments to weave a basket out of fresh grass in which to collect the fruit. "Only this she remembers," said Kiyaykina in her distinct Russian accent. Dr. Liapunova then asked Kiyaykina if she would be interested in learning how to weave. 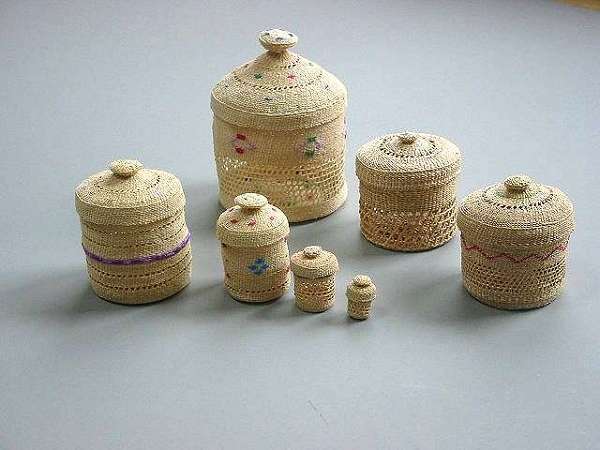 She was'nt at the first, but six months later changed her mind and decided to give it a try Dr. Liapunova mailed her an old Russian booklet, which included some diagrams and patterns of baskets. There were only basic diagrams of patterns and nothing on how to prepare the grasses which took a bit of experimenting to perfect. Dr. Liapunova died two years later; and Kiaaikina went on to join the Canmore based Amiq Institute shortly after, in 1995. Today she has become an expert on the art and has received international recognition, including a native scholarship to the Smithsonian Institution in 1995 to further study ancient Aleut grass weaving. She has also been invited to the Chicago Field Museum and the Glenbow Museum in Galgary. She has taught basket weaving in her village and many Alaskan villages, including St. Paul, St. George, Akutan, Unalaska, Atka and Nikolski. She has also taught in the Bow Valley. The Aleutian native has worked many hours on trying to perfect the baskets, including trying to find the right grass. There are many people today who weave, but have chosen to use synthetic fibres in their baskets. Her colleague and the founder of the Amiq Institute, Suzanne Swibold compares weaving the thin grass fibers to working with silk thread. She marvels atthe simple thing of a piece of grass on hillside and a human fingernail" that can create something so intricate and beautiful. On top of the elegance of baskets, they also have a pleasant natural earthy grass smell. The Homegrown Art Show, which opened Friday (March 3, 2006) at Banff Town Hall, showcases the works of over three dozen Bow Valley artists. The exhibit runs until March 24, and most of the art on display is for sale.